Mike Coyle of Brighton Mitre continues his good form of yesterday's hill climb as he wins on this extremely challenging course. Dave Dent of Wightlink and Charles Mitchell of ...a3crg are the other podium finishers. Dave Shepherd of GS Stella does well to finish in 5th place as he rode the last three miles with a slow puncture which took him off into the grass on a high speed descent towards the finish. Interesting times! Pete Tadros and Mike Coyle repeat their 1-2 placings of earlier in the day. Pete Tadros of In Gear Quickvit Trainsharp RT is the clear winner as he records a fine time of 3:55.7 which is almost half a minute clear of second placed Mike Coyle of the host club. Alice Lethbridge of gbcycles.co.uk is the fastest of a strong ladies showing in this event. Roadworks mean that the course has to be shortened for the event. Conall and Christian Yates take the first prize. A superb ride by Jamie Lowden of Neon Velo in 3:49.1 saw him win by about 10 seconds from Pete Tadros. Pete at least had the consolation of taking both the Sussex CA Hill Climb title and the Sussex CA Veterans Hill Climb title. Not bad for less than 4 minutes work. East Grinstead CC were the fastest team on aggregate and took the Sussex title. Tamar Vanderhaas of Lewes Wanderers had to stop part way to reseat her chain but was never in danger of failing to collect the ladies prize and title since she was the only entrant. James Boynan of Farnham RC wins in a cracking time of 50:48, well clear of second placed Conall Yates (52:04). Michelle Arthurs-Brennan of Redhill CC takes the ladies prize. James Copeland and Gary Chambers are the 2-Up TTT kings with an excellent 51:44. Steve Dennis and Nick Dwyer are first and second on both competitions - the VTTA On-standard competition and also on scratch. Michelle Arthurs-Brennan of Redhill CC is the fastest lady, and Lewes Wanderers take the on-standard team prize. Well this event certainly lived up to its title billing as the afternoon was bathed in glorious warm sunshine. Riders took advantage of this and the (mostly) nice road surface to record a bagful of PBs. A time of 19:01 was only sufficient for equal 3rd place for Kevin Tye and Jamie Lowden as James Boynan and Rob Sharland were even faster with 18 minute rides. Lesley Walkling was the ladies winner, and the perennial Terry Icke was the vets winner. The top four from yesterday's 10 all feature in the top 5 today but with the order shuffled. Pete Tadros takes the win this time in an impressive 51:25. Connall Yates (In-Gear Quickvit Trainsharp RT) is the other rider in the pack as he finishes in second place ahead of Chris McNamara. Once again Philippa Jenkins (Southborough & District Wheelers) takes the ladies prize, and In-Gear are the fastest team by six and a half minutes. A tight finish in a field of real quality as just 8 seconds separates the first four riders. Chris McNamara (Pedal Heaven), James Lowden (Neon Velo) and Keith Lea (Paceline RT) take the podium places, whilst Pete Tadros (In-Gear Quickvit Trainsharp RT) has the consolation of being the fastest rider from an ESCA affiliated club and thus takes maximum points. Well done too for another great ride by Tadros - but this time it's son Theo who was riding in his second ever time trial. Philippa Jenkins (Southborough & District Wheelers) took the ladies prize, and Eastbourne Rovers took the team prize. On a bitterly cold morning the In-Gear Quickvit Trainsharp RT pairing of Pete Tadros and Conall Yates come joint first in an impressive 52:05. James Middleton of Media Velo / Dynamic Rides finishes in third place. 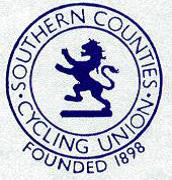 All of the SCCU competition standings are now finalised and can be found in the results sheet. The newly crowned National 10 Mile Time Trial Champion, Richard Bussell, turned up with his much vaunted £965 bike constructed from hand-me-downs and put in a stunning ride worthy of his status. 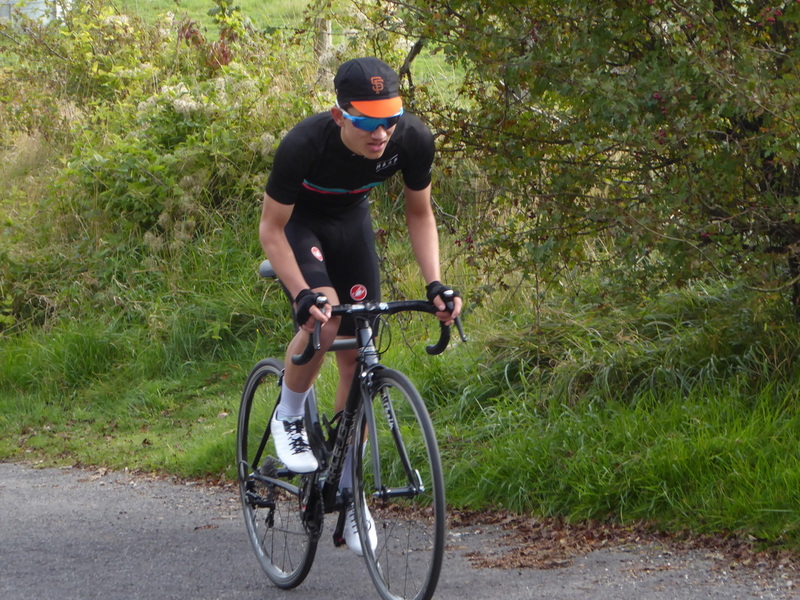 The RST Sport/Aero Coach rider made light of the challenging undulations of the Surrey Hills based course as astonishingly he rode in excess of 30 mph to record a time of 19:54. Nick Malins and Eddie Allen were left trailling (comparatively) in second and third places respectively. Tamar Vanderhaas (Lewes Wanderers) won the ladies event, and Mick Deen of the host club took the prize for Veterans on Standard. Richard Bussell also took time out to win the tandem event as well, riding with Steve Croggon of Beacon Roads CC. Steve Kane of Team ASL360 records a fine win. London Dynamo put in a very strong performance with three of the top five places and win the team prize with an aggregate time of just under 3 hours which is excellent on such a challenging course. Sarah Matthews of ...a3crg win the ladies prize, and the perennial David French of Weybridge Wheelers won the hub gear event. The many non-starters who opted out because of rain in the morning misjudged it as the weather cleared up as predicted an hour before the start. Those who rode were rewarded with weather that was considerably better than the state of the road surface on the country lanes! Tom Pritchard of HRCC wins. Nick O'Hara of 3C Cyclexperience and Greg Parker of Velo Club St Raphael finish in joint second place as a result of a disqualification. The rider who finished in the second fastest time omitted to follow the course instructions for returning to race headquarters. Greg and Nick were also the two fastest Vets on Standard. Lesley Walkling of Velo Club St Raphael took the ladies prize. A great winning ride by Carl Ferri of Cadence Performance who, unfortunately, cannot qualify for the SPOCO SE as the Crawley Wheelers event had to be cancelled for the second time this season. Congratulations to Jack Churchill of Brighton Excelsior CC as he sets a new juvenile course record. Wouter Sybrandy of Sigma Sports is the one rider to go inside 20 minutes. The good news was that the rain held off but a tricky wind resulted in slow times and less than 30% of the field went under the hour mark. Chris McNamara of Pedal Heaven and Steve Dennis of East Grinstead CC dominated the scratch and the vets rankings. Rob Sharland of Paceline RT produced a searing ride to match the conditions as he won by over a minute and also led his club to the team prize. 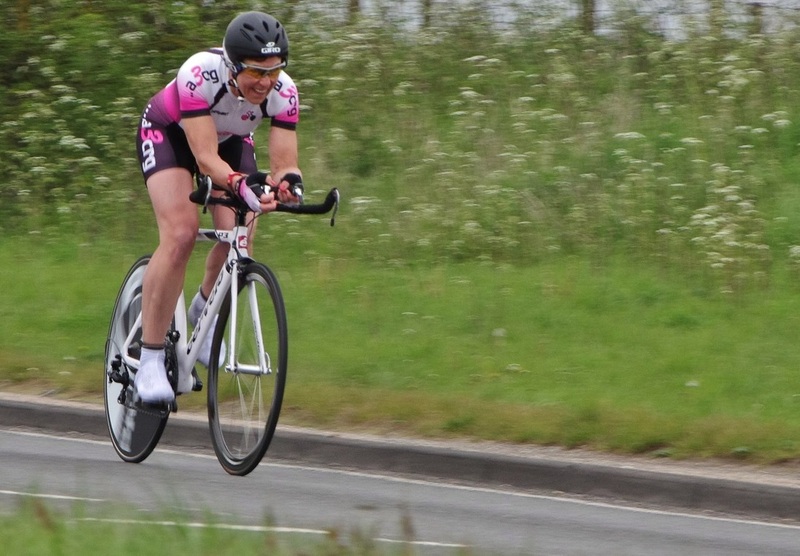 The women's event was more closely contested and had a sizeable entry due to it being part of the South East Women's TT Series. Kate McNeil of www.drag2zero.com was victorious. Michael Deen of Redmon CC recorded a fine time to win the veterans' event. How unlucky can you get?! Originally due in April the event was postponed due to mist and fog on the morning. This rescheduled event had to be called off as well due to unexpected roadwork traffic lights on the course. This popular event (150 riders plus reserves) attracted many riders from Sussex CA affiliated clubs. With an impressive depth of quality in the field the highest placed Sussex rider was Alex Napier of Blazing Saddles who was 6th in 53:11. Mark Bashford of East Grinstead finished in 55:53, and Richard Weatherstone of GS Stella rode a 56:25. Connall Yates of In Gear Quickvit Trainsharp RT takes the main prize as he is the only rider to go inside 21 minutes. Adam Atkinson of 34 Nomads and Pete Tadros complete the podium. Postponed from 20th July due to mist and rain this rescheduled event benefitted from a nice clear evening. All the riders were out on time and all off the road by 19:55hrs. This early finish was due in part to the blistering pace set by this fast field. John Dewey of Dorking CC led the way with a cracking 19:07, barely three seconds ahead of James Boyman of Farnham Road Club. The fastest lady was Rachael Elliott of Newbury Road Club (22:13) just ahead of Lesley Walkling of VC St. Raphael. Fareham Wheelers took the team prize. Plenty of Sussex riders took the opportunity to compete in the National event raced on one of our local courses. Mike O'Gorman of Worthing Excelsior finished in 6th place (+33:35) with a personal best time of 1:53:31. David Shepherd of GS Stella finished in 10th place (+33:04) and was the fastest Sussex rider of the day with an excellent 1:48:45. Steve Williamson of ...a3crg finished in 12th place (+32:01) with a time of 1:45:25. Pete Morris of Team ASL360 and Gina McGeever of Lewes Wanderers triumph in the 100. As new vets this season the McNamara brothers are certainly sharing out the wins. This time it's Simon (South Downs Bikes / Casco) with a fine 20:23, and he takes the age group prize too. Richard Prebble of Giordarna Mitsubushi RT takes second place from Iain Brogden of Eastbourne Rovers. Mel Wasley of Epsom CC wins the ladies' prize with an excellent 22:13, and she is also one of the winning team of 3 riders. Some absolutely cracking times this evening, as the Newbury RC pairing of Rachael Elliott and Ian Greenstreet come out on top. To complete a horrendous season for the BAR events the 100 was played out in identical weather to the 25 and the 50. Each event started in the dry but well before the finish, as predicted by the Met Office, turned into monsoon conditions with cold, dangerous gusting winds. Almost half the field failed to start or abandoned mid-race. The slow times are indicative of the problems faced. Dominic Hill of Bec CC was fastest rider with 4:09:32. Congratulations to Rupert Robinson of Crawley Wheelers as he takes the SCA title with 4:10:18. Mike O'Gorman won the SCA Vets title in a time of 4:24:59, and his club Worthing Excelsior finish ahead of Lewes Wanderers CC to take the team title. No Sussex lady completed the event. A huge debt of gratitude is owed to those helpers and marshals who had to stand or sit around in such weather conditions for well over three hours. A disappointingly small field was reduced even further by the (correctly) predicted weather. Two riders were in a class apart - Dave Dent of Wightlink and Alex Napier of Blazing Saddles. Definitely a day with pluses and minuses. On the debit side was a strong adverse north westerly wind. But to balance that the finish line was in the wrong place so it was only a 9.90 mile ride! Unfortunately this event had to be cancelled just as it was due to start. Rain, mist, spray on the A3 meant that it would have been unsafe. Chris McNamara completes the weekend 10/25 double, whilst his brother Simon led South Downs Bikes to the Team Award. Emma Craddock repeated last year's success by again taking the prize as fastest woman. Chris McNamara of Pedal Heaven wins the big one. Lots of junior activity with this including the District Heat for the GHS Championships. Schaeff Potter of Worthing Excelsior is the fastest junior and qualifies for the National finals to be held in Hertfordshire in August. VC Jubilee take the GHS team prize and also qualify for the finals. At the conclusion there was a silent remembrance of Don Lock. Ten riders go faster than the cut-off time of 56 minutes. John Samways of Bournemouth Jubilee Wheelers finishes exactly a minute ahead of second placed Matt Peel (Redhill CC) with a rapid time of 53:03. Bournemouth Jubilee Wheelers take the team prize as Worthing Excelsior finish in second place. Mike O'Gorman of Worthing Excelsior wins the veterans' competition. Lewes Wanderers sweep the board. Nick Dwyer wins the scratch event. Tamar Vanderhaas wins the ladies' event. And to round it all off they take the team prize too. Perfect weather for this event. Pete Tadros of In-Gear Quickvit Trainsharp RT wins again. In direct contrast to the Met Office prediction only 24 hours earlier the weather conditions were truly awful as monsoon conditions lashed the riders and giant lakes made the road surface treacherous. James Rix of Crawley Wheelers took the title with a 1:55:45, just 33 seconds ahead of Simon McNamara from South Downs Bikes. Simon unfortunately punctured just 5 miles from the end but did manage to borrow a spare wheel so that he could complete the course, albeit and somewhat scarily without any effective brakes due to the difference in rim width. Long distance specialist Dave Shepherd of GS Stella completed the podium. Sarah Matthews of ...a3crg continued her excellent season by adding the ladies 50 title to the 10 and the 25 that she had won earlier in the season. Mike O'Gorman of Worthing Excelsior CC won the veterans 50 title despite being knocked onto the ground mid-race by an inattentive driver. Ignoring the injuries sustained Mike remounted to complete the event as it is a BAR qualifier. Worthing Excelsior CC took the team prize. Mark Smith of Crawley Wheelers wins the scratch event. Nice weather and a fast course sees 58 riders go under 2 hours. Nick Dwyer of Lewes Wanderers is the fastest of them all with a hugely impressive 1:45:19. Michael Ford of Pewsey Racing Project wins, with the McNamara brothers finishing in second and third behind him. Rachael Elliott of Newbury RC knocks out a highly impressive 55:21 to win the ladies event, and a trio from Lewes Wanderers CC take the team prize. Pete Tadros of In-Gear Quickvit Trainsharp RT completes the double for the weekend as he finishes well clear of second placed Steve Dennis of East Grinstead CC and third placed Keith Lea of Paceline RT. Katerina Avramides of Brighton Mitre CC is the fastest lady, and Team ASL take their second team prize of the weekend. Pete Tadros of In-Gear Quickvit Trainsharp RT just beats Jack Donaldson of Neon Velo for the winners prize, with Adam Atkinson of 34 Nomads not far behind. Helen Bullimore of In-Gear Quickvit Trainsharp RT wins the womens' event, and Team ASL360 take the team prize. As is always the case, the 25 event proved popular and there was a large entry from SCA affiliated riders on the course that starts in Sussex and finishes in Hampshire. The best performance was by a member of a newly affiliated club as Simon McNamara of South Downs Bikes smashed his personal best with an excellent 51:10 to finish second overall. James Rix of Crawley Wheelers was close behind, and Nick Dwyer recorded an excellent 52:57 to finish in seventh place. Age group winners included Mark Smith of Crawley Wheelers (53:13), Nick Dwyer of Lewes Wanderers (52:57), Mike O'Gorman of Worthing Excelsior (55:53). Crawley Wheelers won the team prize with a superb aggregate of 2:39:28. Pete Tadros of In-Gear Quickvit trainsharp RT adds yet another win to his season's tally. He wins the vets competition as well just for good measure. The host club have success as Julia Hawksworth wins the ladies competition, and they take the team prize too. A small field and strong blustery conditions for the inaugural championships at this distance. The win went to a member of a newly affiliated club, so very well done to Dom Maxwell of Sussex Revolution VC for his first win in an Open event. His time of 35:37 was a good one in the conditions and placed him just ahead of Stu Nisbett of Crawley Wheelers, with Mike O'Gorman of Worthing Excelsior finishing in third. Gina McGeever of Lewes Wanderers CC took the ladies prize. Mike O'Gorman won the Vets 15 title and his club Worthing Excelsior took the team prize. Pedal Heaven score a 1-2 as Robert Moore beats teammate Chris McNamara for the overall win. Delia Beddis of Les Filles Racing Team is the fastest lady. Pete Tadros of In-Gear Quickvit Trainsharp RT wins again as he relegates Simon McNamara of South Downs Bikes to second place. Another impressive performance by Rob Sharland of Paceline RT as his time of 20:15 on this lumpy Surrey Hills based dual carriageway puts him well clear of the rest of the field. This was a qualifying event for the South East Womens' Time Trial Series (SEWTTS) and this helped to boost the numbers with 19 women competitors out of 43 starters. Maryka Sennema of Paceline RT was the winner of that event. Just a shame that 25% of the entrants were DNS. Poor weather conditions cause more than half the field to tender their apologies for not starting. Iain Brogden of Eastbourne Rovers wins the scratch event; Colin McDermott of Festival Road Club is the vets winner, and there is a tie in the ladies event. Rob Sharland of Paceline RT wins the scratch event. Pete Tadros of In-Gear Quickvit Trainsharp RT wins the vets first prize. Conall Yates of In-Gear Quickvit Trainsharp RT retains his Sussex 30 title and is almost a minute quicker than last season. Mike O'Gorman of Worthing retains his Sussex Vets 30 title and sets a new record as he improves his plus by four and a half minutes. There are new names to go on the honours board though. Gina McGeever of Lewes Wanderers takes the ladies title and the team award goes to newly affiliated South Downs Bikes. Great to see them represented so well today and Simon McNamara finished on second place overall. Another newly affiliated club fared well too with Howard Bayley of Blazing Saddles putting in a strong performance. Simon McNamara and Pete Tadros share the honours, whilst Gina McGeever takes the prize for the ladies 'bling' 10. Virtually no wind made this a good opportunity for several riders to improve their personal best times. Conall Yates of In-Gear Quickvit Trainsharp RT was the fastest man on the day with an excellent 52:41 and was well clear of the rest of the field. Two riders unfortunately went off course, including the rider initially placed second. Mike O'Gorman of the host club was the Vets winner, and Helen Bullimore of Trainsharp RT was the Ladies winner. Once again In-Gear Quickvit Trainsharp RT are victors in the Team awards. Pedal Heaven dominate this event. They take the first three places with Chris McNamara scorching around in a brilliant 19:41. They therefore take the team prize too - in a record time. Alan Robinson of Central Sussex CC takes the Vets prize and Michelle Arthurs-Brennan of Redhill CC is the Ladies winner. Not a Sussex course, nor a Sussex club. Nevertheless many riders from a range of SCA affiliated clubs made the short trip across the county border for this event. A field of real quality in depth - be amazed at just how quickly some riders can travel 50 miles. Today Pete Tadros has to settle for second place as he splits the McNamara brothers on the podium. John Dewey of Dorking CC beats Nick Dwyer of Lewes Wanderers, with Alex Napier of Blazing Saddles close behind as they all record impressive times. The most painful ride was for Rob Sherrin of the host club as his saddle came off leaving him to ride the last 10 miles standing up. Julia Shaw of drag2zero took the ladies prize and the vets on standard prize too. Blazing Saddles (just affiliated with the SCA this month) showed fine form by winning the team award. An impressive prize list for this event. Remarkable. Despite a small entry three riders tie for second place behind Pete Tadros. Astonishingly bad weather with torrential rain, lakes on the road and strong gusting winds. Immensely unpleasant for riders and officials alike. Chris McNamara (Pedal Heaven) returns to form as he is fastest in an amazing time of 54:15. Conall Yates (In-Gear Quickvit Trainsharp RT) and Pete Morris (Team ASL360) are tied for first place and the 2015 Sussex title and the Boniface Cup. Sarah Matthews of ...a3crg wins the SCA ladies title. In-Gear Quickvit Trainsharp RT take the SCA team title and the Lee Memorial Shield. Mike O'Gorman of Worthing Excelsior takes the SCA vets title and the Horry Hemsley Cup. Additionally, ...a3crg win the Dave Henty Cup as the second fastest team of four riders, as well as medals for having the fastest B team of three riders. Clearly strength in numbers there. A high quality field in which the first six were all quicker than the time needed to win last season. Huge congratulations go to Tom Glandfield of Lewes Wanderers for a superb victory over some big names. In-Gear Quickvit Trainsharp RT take the SCA team title. Mike O'Gorman of Worthing Excelsior takes the SCA vets title. Jack Churchill of Brighton Excelsior wins the Juvenile award. obert Moore of Pedal Heaven with a 55:10 edges ahead of Martin Williamson of London Dynamo by a mere six seconds. Madelaine Lee-Smith of Oxted Cycling wins the ladies' competition. Richard Gifford of In-Gear Quickvit Trainsharp RT finishes third overall but wins the veterans on standard competition. Host club Addiscombe CC gained their reward by winning the team event. And a special mention must go to the team that put together the catering. What an unusual and tempting range of items. Absolutely excellent. Wins for James Lowden of Neon Velo and Tamar Vanderhaas of Lewes Wanderers CC. Tom Glandfield of Lewes Wanderers is the fastest ESCA affiliated rider on the day, and is part of the three that win the team prize. Definitely a day when day-glo Velotoze was hugely in evidence! Pink overshoes for the men? Hmmmm. A soggy cool morning didn't stop John Dewey of Dorking CC smashing his way up and down the A22 for a 20:28. This placed him well clear of Simon McNamara (South Downs Bikes / Casco) and Nick Dwyer (Lewes Wanderers CC). 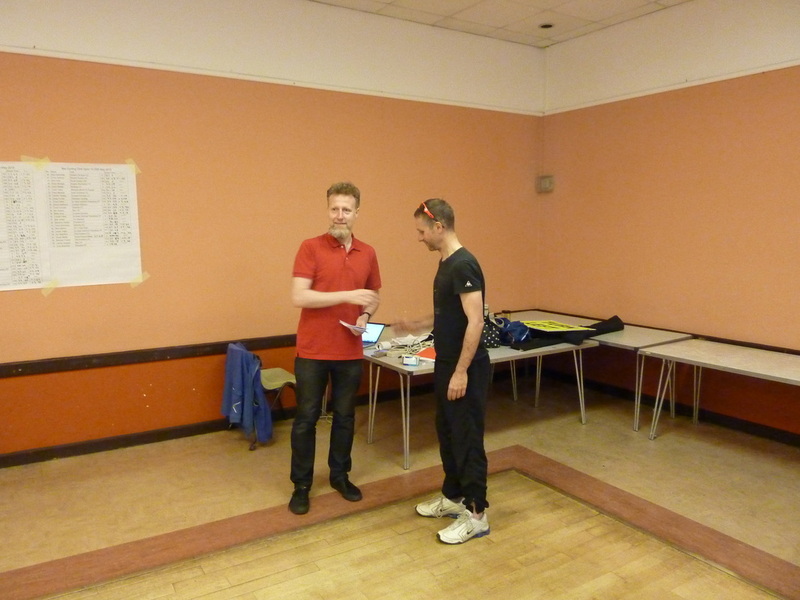 But it's Nick that takes the first place in the ESCA Championship 10 as the fastest rider of an ESCA affiliated club. Well done to Ruth Summerford of Eastbourne Rovers for putting a dent in Tamar Vanderhaas' winning streak in the ladies' competitions. Lewes Wanderers CC won the team prize in a close run thing with Eastbourne Rovers CC. Cool, breezy but dry weather seemed to slow times down as everyone felt that it was a hard morning on this course. 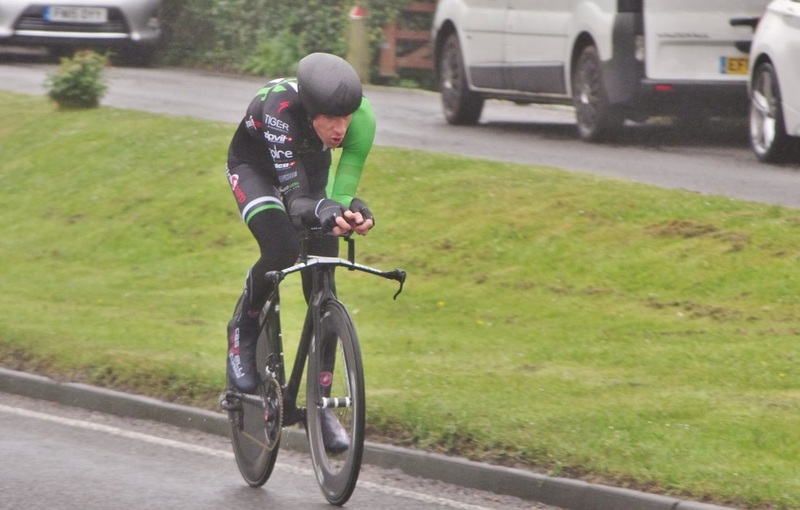 Pete Tadros of In-Gear Quickvit Trainsharp RT showed his versatility, following his win in last week's hilly 25 with a win here on the dual carriageway roundabout-fest. Adam Atkinson of 34 Nomads CC was very close behind in second place. In-Gear were the team winners. Tamar Vanderhaas of Lewes Wanderers CC took the ladies' prize and Mike O'Gorman of Worthing Excelsior CC took the veterans' prize. Patrick Brennan and Seb Ader of ...a3crg are the fast men as they take the title. Steve Kane and Pete Morris are the fastest road bike pairing. On a sunny windy day John Dewey of Dorking CC triumphs on the reserve course at Broadbridge Heath. Well something had to give. Would it be Pete Tadros' magnificent run of consecutive wins in this challenging event, or would it be Chris Mac's superb undefeated run of time trials this season? It was Pete who came out on top in this one. Chris did have to walk his bike around a blockage due to a bin collection lorry in a narrow lane already congested with parked cars, but even so Pete's winning margin was sufficient that eventually it was not decisive. Great weather. Warmer and hardly any wind, not even high up on the Downs. Chris McNamara and Richard Cartland are the fastest pair on course, but it's Robert Rollings and Tom Glandfield that take the ESCA title. Pete Tadros does it again! As expected. Some surprising results in there too. 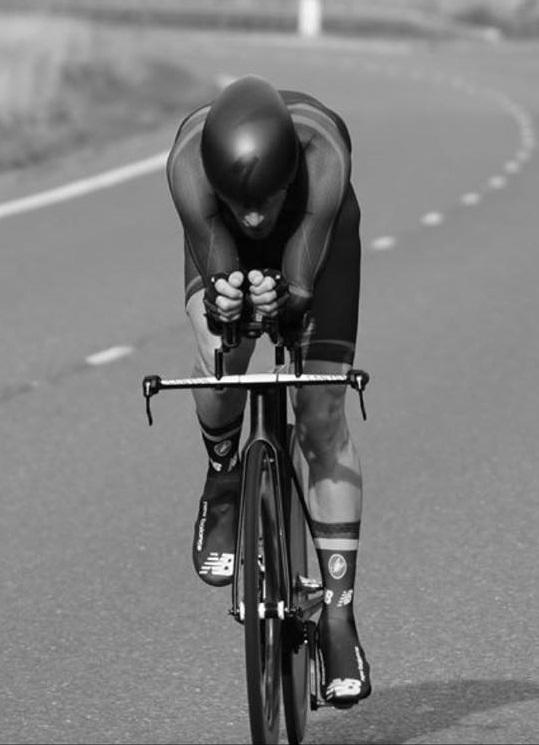 There was an absolutely stand out ride from 12 year old Alistair Canning (VC de Londres) in his first ever time trial. A time of 24:53 is excellent but if he hadn't been penalised 1:40 for a late start then he have finished in second place. Quite remarkable. Also an excellent ride from 18 year old Joe Kingsman (Hastings & St Leonards) who would also have been quicker if he hadn't messed up his start. Event cancelled due to atrocious visibility with fog enveloping the Handcross area. UPDATE: This event eventually suffered a double whammy. After being rescheduled to run in August it then had to be called off for a second time due to unexpected pop-up roadworks. New course P877 makes its debut. Unfortunately there was horrendous weather with strong gusting winds and driving rain. Consequently there were a large number of riders opting not to start. 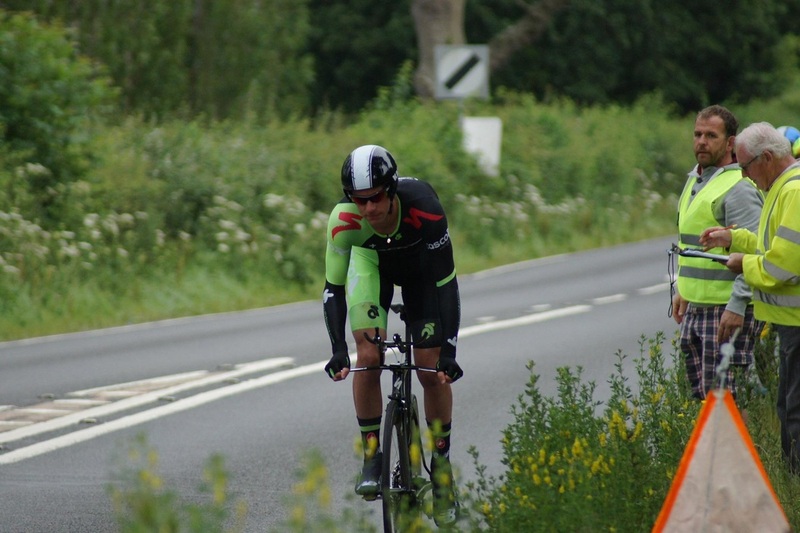 Simon McNamara (South Downs Bikes) wins the TT bike event from host club rider Seb Ader. David Pollard wins the Road Bike event. Leon Fielding and Joel Garner win the 2 Up Team Time Trial. Originally scheduled to be run at the start of February this event was postponed due to icy weather. Virtually half the field were non-starters today, presumably because they were committed to other conflicting events, and that is a shame for the organisers who put in the effort. As one might expect Pete Tadros (In-Gear Quickvit Trainsharp RT) cleaned up, winning the overall event, the veterans' prize and the team prize. A challenging day all round. This new course was created because long term roadworks meant that the usual course was unavailable. Essentially 3 laps of the tough 10 course (but fortunately not 30 miles!) this course definitely earns its SPOCO rating. As if that wasn't bad enough riders had to contend with a flock of escaped sheep wandering around in Ockley together with the resultant police and vehicles involved, plus having to negotiate horse riders on the course too. Some riders were luckier than others. Huge respect is due to the three riders who beat the hour mark: John Dewey (Dorking CC), Liam Maybank (Twickenham CC) and Jack Donaldson (In-Gear Quickvit Trainsharp RT). Equally to Pat Wright (Paceline RT) who came fourth in 1:00:49 on a roadbike. Well done indeed. London Dynamo were team winners and Alice Lethbridge (gbcycles.co.uk) wins the ladies' event. Another cold windy day. Another win for Chris McNamara (Pedal Heaven) as his winning start to the season continues unabated. Just five riders go inside 24 minutes on this demanding course. Sarah Matthews of ...a3crg takes the ladies' prize, and Eastbourne Rovers CC take the team prize. On a cold morning with a stiff north-easterly wind this was just the course for Pete Tadros to demonstrate his class, and he did just that to win by 11 seconds from Pete Morris. And he took the hill prime award too. Simon McNamara completed the podium positions. Tamar Vanderhaas continued her fine form by winning the ladies' prize. In-Gear Quickvit Trainsharp RT were team winners. A prize fund of £2,150 attracts a class field. Chris McNamara (Pedal Heaven) continues his fine form, beating the recent Kingston Wheelers event winner Rob Sharland (Paceline RT) into second place, with last year's winner of this event Liam Maybank (Twickenham CC) completing the podium. Early pace setter John Dewey (Dorking CC) eventually had to settle for fourth place. Alice Lethbridge (GB Cycles) took the ladies prize, and Paceline were team winners. The prize for the best veteran on age related standard times was Reg Smith (Velo Refined Aerosmiths). Nice sunny weather and warmer temperatures than recently provided a welcome relief, albeit with an extremely strong westerly wind to make this tough event even tougher. It seems that Chris McNamara of Pedal Heaven has picked up just where he left off last season with continuing strong form. He followed on from his win in last week's Redhill event with another imperious performance. His time of 53:34 was over a minute quicker than second place man Liam Maybank of Twickenham CC. Tom Glandfield of Lewes Wanderers CC, in fifth place with 56:00. was the quickest SCA affiliated rider, narrowly pipping Pete Morris of Team ASL360 by a mere six seconds. Amy Forshaw of Trainsharp RT was the quickest of the four women starters with a very creditable time of 1;06:51. Tim Stevens of 34 Nomads CC was the fastest veteran on standard and East Grinstead CC took the team honours. Big thanks to Paul Wright for providing us with a sideshow. In a high quality field defending champion Chris McNamara takes the honours in the season's opening time trial and Alice Lethbridge wins the womens' prize. Particular mention goes to Pete Tadros who finished in a remarkable 10th place given that he rode the last two miles carrying his saddle clamped between his teeth.